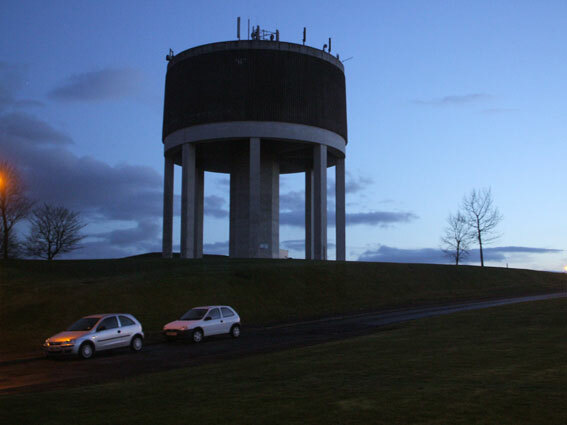 This tower was on a council estate on the edge of a small town called Lanark in Scotland. The structure took me by surprise, the mobile phone antennae on top of the tower intriguing me as to what sort of frequency messages they might be encouraging the water to remember?! However another point came to mind that perhaps those users more familiar with the technical side of antennae building and radio may be able to answer. As most concrete structures require a mesh support system of metal, would the internal structure of the water tower itself be acting as an antennae, and at what frequency would this water tower be vibrating or transmitting? I wonder what effect the water contained in the structure would have on the attenuation of EM energy passing through the tower? Also, from a point raised in another project; in the commercial sell-off of parts of the EM Spectrum by Governments, also comes the selling-off of our rights not to receive radiation through our bodies in various circumstances. In the advent of smoke-free and noise-free zones, will there come a time when there will be EM-free zones, or will the invisible perhaps always remain so? I'm not so sure that I would drink water from this reservoir, would you?